Designed to offer maximum function in a minimum footprint The Inspire Fitness M2 Home Gym represents all of the capability of a multi weight stack gym in a compact, single stack, forward design. 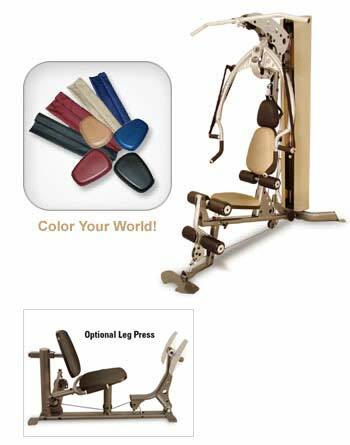 Its unique press arm offers both fixed pressing exercises as well as free motion movements. Why is this important? Well, fixed pressing exercises help develop size and strength, while free motion movements improve mobility and coordination. For maximum benefit in a minimum amount of time, the Inspire Fitness M2 Home Gym is the answer. In its construction it uses commercial 11 gauge steel for its frame, nylon pulleys (not plastic), 2000lb. tensile strength cables, and precision ball bearings in its press arm pivot. Along with two tone high gloss paint and orthopedic pads, the Inspire M2 Gym is not only highly functional; it's a sight to behold. The Weight Stack Shroud is constructed of a Heavy-Duty Canvas. There are four standard color choices in the Orthopedic Seat Pads and Canvas Weight Stack Shroud to match the decor of your home! The color choices are: Black, Tan, Burgundy, and Navy Blue. Weight Stack: 150 LB. Commercial Weight Stack with Solid Guide Rods and Center Drilled Weights. Upgradeable to 200lb.